Ahh, Soap and Glory! If the annual stampede for their half-price Boots Star Gift is anything to go by (it must be coming up soon! ), lots of you share the love I have in my heart for this cheeky, great quality British brand. I was recently sent a bundle of goodies that I have been using and loving – so much so that many of them are now firm favourites with me that I’ll be buying and using for ever and ever amen. I particularly liked the lip products – the Smooch Operator lip balm, €8.50, and amazingly named Soap and Glory's Super Colour Fabulipstick Powdercoat Matte Lipstick in Pom Pom, €12.50, both made it into my newspaper column in the Metro Herald. (What, you didn’t know about that?! I’ll fill you in real soon). The balm is buttery and soft and has been keeping my winter lips in good nick, while the lippie is another one of those modern mattes I’ve been loving so much - they’re comfortable and easy to wear, look great and last forever. This one is a lovely deep pink. That powder there is Glow All Out, billed as a luminising radiance face powder, and it pretty much does what it says on the tin. It’s a lovely natural highlighter that’s not glittery at all but gives a lovely peachy-pink sheen to the face. This is €15.25. FOTD wearing all products shown. And as for the eye products, WELL. This is where I was completely blown away. 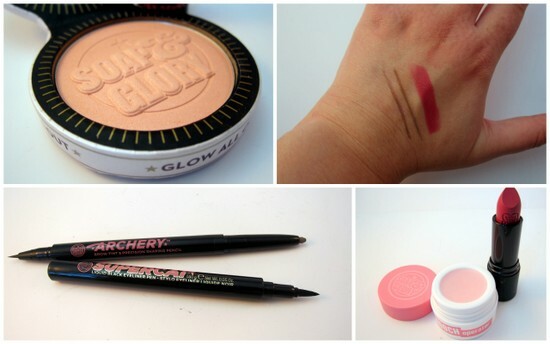 My fondness for Supercat Liner has already been documented (read my review here) but it’s been knocked off its perch as Very Favourite Soap and Glory Cosmetic Product Ever by this genius brow product, Archery. I have been loving felt tip pen products for my brows lately and this has that at one end for filling in gaps naturally, while at the other, there’s a precision pencil for creating fullness. Great value too for €14.5o. So tell me, are you a Soap and Glory fangirl too? What products should be next on my list? This is the first time that I hear about this brand. I like the colour of the lipstick! I've not tried their make up, but I like the sound of the brow pen! I hear so many bloggers raving about it that I definitely want to try it. But where to begin? Everything from S&G looks lovely! I wish we got this brand here, love their stuff, you look so stunning, love the lip shade. Good ideas and nice taste! Emma you look positively gorgeous in that lip color! Love the packaging and also the colors are so pretty! Too bad we don't have this in the us. I'd love to try the brow pen, I've been seeing a lot about felt tip ones recently and it sounds like they're really natural, as you said! I love these products on you Emma! I still have yet to try out any soap and glory make up. I really need to since I love their body stuff so much! I didnt hear about this brand before. Great post and nice job. Have a great day. You look lovely! So pretty! I hope they bring these products over here soon! They look amazing! I never seem to be come across their make up range in any boots I've ever gone into and I really want to try all of these! I'll definitely be keeping a look out for them! I've never seen it before but I am so looking for this when I'm in London!